It sounds like something out of a horror movie, but the so-called super wolf blood moon coming this weekend is just a pretty celestial spectacle. Too bad Mainers may not be able to see it. 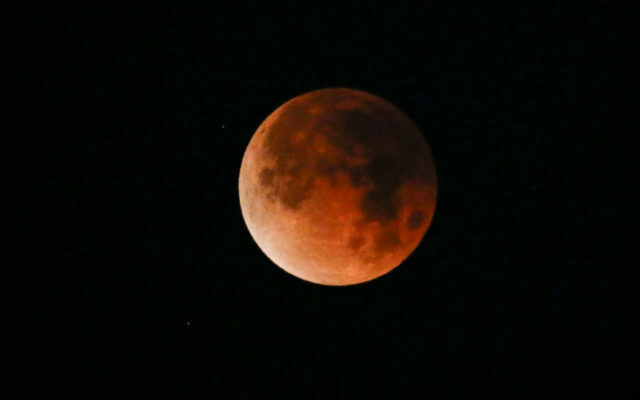 The total lunar eclipse taking place Saturday night will be the first one theoretically visible in its entirety across the United States since 2010, according to Accuweather.com, and the last until May of 2021. It’s called a “blood moon” because it will pass through the Earth’s shadow, giving a reddish hue. It’s called a “super moon” because it’s passing by more closely to Earth than usual, so it’ll appear a bit larger. And it’s called a “wolf moon” because that’s what full moons in the month of January are called, going back to prehistoric timekeeping names attributed to a number of different peoples. But although this somewhat rare spectacle should be viewable from any point in North America, long-term forecasts for Maine, including from our media partners at CBS 13, show clouds and almost certain snowfall Saturday night. If the weather doesn’t change between now and then, Mainers can watch a live stream of the super wolf blood moon — or super blood wolf moon, depending what you read — online here. The first phase of the eclipse will begin at around 9:30 p.m. and will be reddest from just before midnight through nearly 1 a.m. Sunday, according to Accuweather.com.